HySpell Armenian Spell-checker installs into FireFox browser as an extension library enabling the spell checking of your Armenian text entries over the web. This means that you can now spell check as you type Armenian text in any web application, including web mails, bloggers, comment sections, twitters, and others. 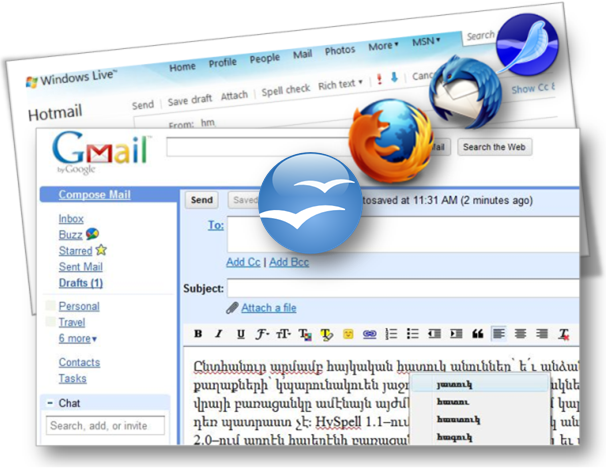 HySpell also integrates with SeaMonkey, an alternative web browser, email client and web editor application. If you prefer email clients to write your emails and are fond of Thunderbird, we have a good news, HySpell also integrates with Thunderbird. Extending FireFox browser enables you to spell check your Armenian messages in Facebook, or your emails written in Gmail, Yahoo! Mail or Hotmail. The spell-checker works in any text area on any webpage, including blogs, twitters and comment sections. HySpell also integrates with Apache OpenOffice applications, including Text Document, Spreadsheet, Presentation, as well as the rest of OpenOffice suite.